After a short overnight stay in Santa Fe, we hit the road for a scenic two hour drive through remote country to Taos Ski Valley. As we ascended up the mountain, a winding canyon slowly separated us from the high-desert below and the winter wonderland awaiting us above. It doesn’t seem possible that you should be able to experience such extremes just moments apart, but this juxtaposition only adds to the state’s enchantment. Pulling into the valley we were able to see everything the ski village had to offer from our car window. It’s quite small, yet quite charming. At the center of it all is the newly opened boutique hotel, The Blake, which is reminiscent of a cozy European alpine hotel with all the luxury amenities you’d expect at a fine ski resort. We spent the next two days enjoying the property, hitting the slopes and eating green chiles on everything, all while soaking up the local scene - a diverse melting pot of people, cultures and art wrapped up in Southwestern mellowness. It’s unlike anywhere I’ve ever been. Taos is not the easiest location to reach, but the extra time and effort to get there is well worth it! For anyone flying in, you’re best option is to fly into Albuquerque and rent a car. Alburquerque offers the most airline and flight options, but is a three hour drive to Taos Ski Valley (note I keep saying Taos Ski Valley because the town of Taos is different and it will take you another 45 minutes to drive to the ski resort from there). If you live in Austin or Dallas though, you’re in luck, as Taos Ski Valley recently launched its own airline, Taos Air, which offers scheduled nonstop flights from these origins. There is also a daily shuttle service during the winter months from the mountain to the Albuquerque airport that will cost you $85 each way. If you are renting a car, the route you’ll take goes directly through Santa Fe, making it the perfect addition to your time in New Mexico. We bookended our trip with nights in Santa Fe and loved everything about the city and surrounding area! Another great way to break up the drive is with a pitstop at Ojo Caliente Mineral Springs Resort and Spa. All I’ll say about it is every article I read on New Mexico tourism said relaxing in the resort’s healing waters was a must-do, and after experiencing it for myself, I highly recommend adding it to your itinerary! We tossed around the idea of renting a house, but, in the end, booked rooms at The Blake which was hands down the right decision! As I mentioned before, the Blake is an 80-room alpine guesthouse adjacent to the mountain’s main lift. Guest-service hausmeisters are on call to attend to every detail, while well-appointed rooms and sophisticated suites lull guests into welcomed relaxation. Our room was spacious with well-thought-out features like a large mudroom by the door and a washer and dryer, both super helpful with wet ski gear. Another top-notch amenity on property was the ski rental process which all the skiers in our group raved about and said was as easy as could be! I could go on and on, but we all agreed the hotel is what really made our experience in Taos Ski Valley special. Other properties that are in the village are Edelweiss Lodge & Spa and Hotel St. Bernard, both ski-in/ski-out and mainstays on the mountain for years. There are also handfuls of great vacation rentals homes decked out in Navajo decor and suitable for large groups, but all the ones I found weren’t located on the mountain but on the outskirt of Taos, so be prepared to spend time in the car if that’s the route you go. While traveling, there are few things that immerse you into a culture more than local food and I love eating at all types of restaurants while on vacation. With that said, the fact that we ate dinner both nights at the same restaurant only goes to show how great it was! Make sure to have at least one meal at 192 at The Blake. Centered around a communal fireplace, this intimate dining room mixes alpine architecture with New Mexico design and features a diverse menu. The village has a handful of restaurants, most with casual, laid-back atmospheres perfect for a quick bite between runs. The best lunch can be found on the deck of the St. Bernard enjoying a green chile burger with views of the Sangre de Cristo Mountains. Also be sure to make reservations in advance for dinner in the dining room of the St. Bernard which not only has good food but a super cool atmosphere with wooden beams, a spitting fire and copper kettles. I felt like I was in a rustic chalet in the Swiss Alps about to devour fondue. No ski trip is complete without après-ski, and being in New Mexico, the village’s hot chocolate stand has delicious versions infusing flavors of cayenne pepper and cinnamon, and make sure to get fresh mini donuts to go with it! The ski village’s elevation is very high. In fact, it’s one of the highest places in the US reaching 9,300 feet, and that’s before you head up the slope to ski! As with any high elevation, you’ll want to make sure you drink plenty of water to avoid altitude sickness, and if you are prone to altitude sickness come prepared with any necessary medication as there is a limited selection of products at the only convenience store. Lift tickets will cost adults $110/day. I can’t speak to this as I didn’t ski since we brought our baby, but I read that terrain may be one reason the crowds aren’t here. Taos doesn’t boast an incredible amount of runs to entertain beginners and intermediates for more than a few days (just a quarter of the skiing is devoted to each). The rest of the trail map — more than half — is covered in black (expert) runs. As I mentioned, the village is small with a handful of restaurants and shops, primarily sport outfitters. There’s not a ton do it if you aren’t skiing, but snowmobiling and cross country skiing are also available. And, for those just wanting to relax, The Blake has a heated outdoor pool and spa. In the last year, a spacious children’s center and ski school have opened making Taos more family friendly. The ski school teaches the Terrain-Based Learning program, which uses purpose-built snow features in the beginners’ area to help assist new skiers and riders by naturally controlling their speed. There’s also child care available for kids 6 weeks to 3 years. Taos is the first and only ski area in North America to earn the B-Corp badge, meaning it meets the highest standards of verified social and environmental performance. The village is on its way to meeting an ambitious goal to reduce its carbon footprint by 20 percent by next year, and things like plastic water bottles are hard to find (The Blake will provide a reusable geo-thermal container). New Mexico offers incredible opportunities whether it be gallery hopping in Santa Fe or horseback riding through the desert. There are many attractions in and around Taos that are worth exploring if you have the time. Taos Pueblo - A crucible of Native civilization, the town of Taos was a northern outpost of Spain’s colonial empire. 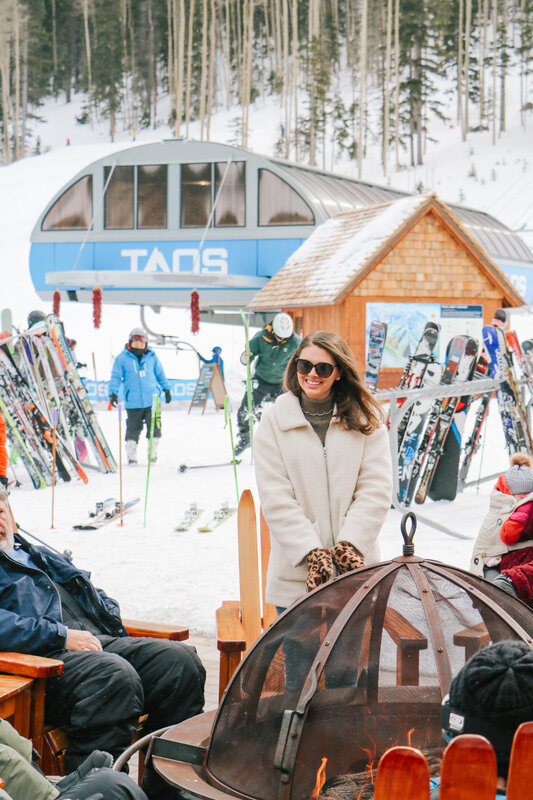 From the ski area summit you can look out at peaks and land owned and inhabited by one of the oldest cultures in North America, the Taos Pueblo people. A real slice out of history that has survived modernization, the Pueblo has been inhabited for over 1,000 years and today is a UNESCO World Heritage Site and a National Historic Landmark. Rio Grande Bridge - The Rio Grande del Norte National Monument is the 242,555 acres of open public land that stretches out beyond the town of Taos. Ghost Ranch - Less than two hours from the ski resort lies Georgia O’Keefe’s famous New Mexico home and studio, Ghost Ranch, which was the subject of many of her paintings. We didn’t get to make it here but we did tour her namesake museum in Santa Fe, which I highly recommend. Ojo Caliente Mineral Springs Resort and Spa - After an exhilarating day on the slopes, a soak in the soothing hot springs of Ojo Caliente is more than welcomed. It is the only hot springs in the world with four different types of mineral water including lithia, iron, soda and arsenic. There are twelve pools throughout the property filled with different combinations of these waters, all meant to benefit the body whether it be by aiding digestion, reducing inflammation, supporting the immune system, etc. Even though it’s not somewhere I would typically stop, I loved our time there and would definitely visit again!